Keeping livestock healthy is important for their wellbeing, as well as for the farm's bottom line. That is why it's so important to keep feed covered to prevent it from losing crucial nutrients or spoiling. Covering hay, silage and grain properly will keep moisture and rodents out, ensuring that livestock get clean, fresh feed year round. At TekSupply, we offer a variety of forage covers for any application or unique situation. Why is covering forage important? Covering livestock feed keeps it protected from the elements, and also keeps it from becoming too dry or too moist, depending on the season. During the winter, snow and ice can cause mold and bacteria to form on the feed, which is hazardous to the health of your animals. Forage covers also help prevent the spread of disease from rodents and other pests. Uncovered feed can lose its nutrients, and in some cases can cause animal refusal. 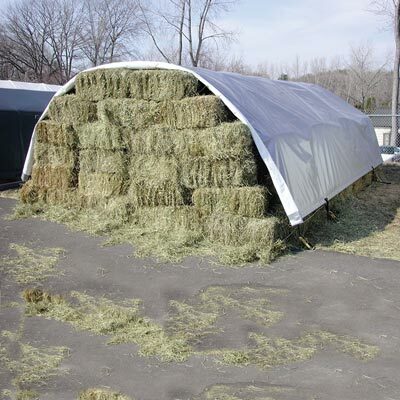 What types of hay covers does TekSupply offer? 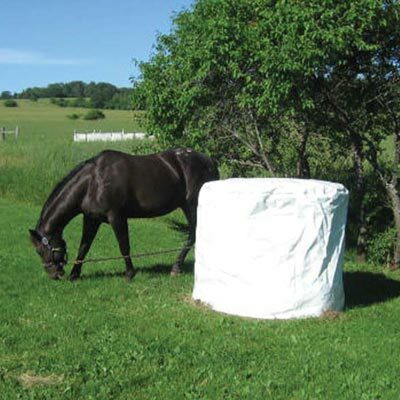 TekSupply offers many different hay tarps, as well as round hay bale covers which are ideal for use in the field. Round Hay Bale Covers are used to individually cover bales of hay in the field. This prevents workers from having to use large farm equipment to move bales from a storage building to the field throughout the winter. Simply place the bales around the field and uncover them as needed. As the animals move from bale to bale, they will fertilize the field. Round Hay Bale Covers come with a grommet on each side of the base. They can be easily anchored down with Poly Rope and a Ground Stake for easy placement and removal. When using these covers, it is important that the bales are dry and very little moisture is trapped inside. PolyMax® Silver/Black 6 oz. 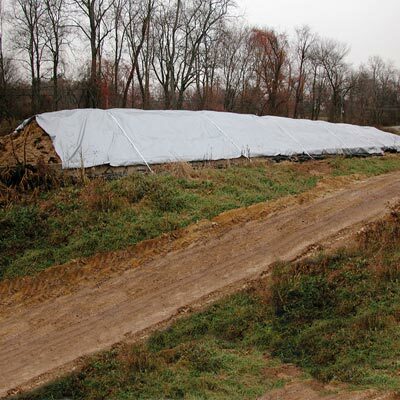 Hay Tarps are a low-cost option for keeping hay protected from the elements. They are ideal for both heat-sensitive and light-sensitive storage. These tarps have grommets every 18" and reinforced corners to make anchoring easy. We recommend using Poly Rope and Ground Stakes every two to three feet to keep the cover secured. In windy areas, using ratchets and straps as an anchoring method is a better option. When using Silver/Black hay tarps, the silver side should be facing out to reflect heat and light. For a more long-lasting hay tarp, we recommend PolyMax® 7.5 and 10 oz. Premium Hay Tarps. 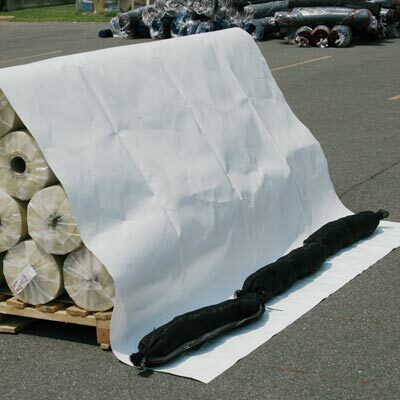 These tarps are made of rip-stop polyethylene fabric for durability, long life and nutrient retention. Straps and pockets are installed on the side of the tarp for anchoring. Anchoring tarps properly is crucial. If a tarp is not anchored correctly, it can be destroyed by wind, leaving hay exposed to the elements. What types of silage and grain covers does TekSupply offer? TekSupply carries Silage Film, Grain Covers and Mesh Silage Bag Covers to keep grain and silage out of the elements when stored in bulk. Black/White 5 mil Silage Film is an airtight animal feed storage cover that protects nutrients by keeping sunlight and oxygen out. In a silage bunker, oxygen causes feed to rot, so it is important to use a tractor to compress the silage and remove air from inside the pile before covering it. Once this is done, the silage film can be placed over the top of the pile to reduce the amount of oxygen that reaches the feed. When using Black/White Silage Film, the white side should always be facing out to reflect light. To access the feed in the pile, cut back the film and remove as much as you need. We do not recommend anchoring the film down with tires because they can quickly become unsanitary, risking contamination of the feed. Instead, use Gravel Bags every 6 to 10 feet to hold the film down. Gravel bags allow for easy drainage, and do not collect water or attract rats. 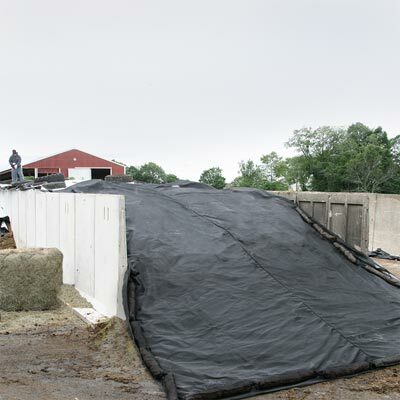 To protect the Silage Film from tearing, we suggest using PolyMax® Mesh Bunk Top Covers on top of it. This shade-like material is placed over the film and secured down with Gravel Bags along the sides. Using this cover in conjunction with Silage Film will protect feed from wind, weather, birds and animal damage. To protect large quantities of grain from spoiling, cover the pile with PolyMax® Grain Covers. Rather than buying additional grain bins when you have a surplus of feed, these covers are a temporary or permanent low-cost alternative. The white interior of Grain Covers prevents heat buildup, while the silver exterior reflects harmful UV rays. This moisture-proof and durable material offers superior nutrient retention. Grain Covers can also be anchored with Gravel Bags. For added security, they can also be anchored down with rope and ground stakes, or ratchets and straps. 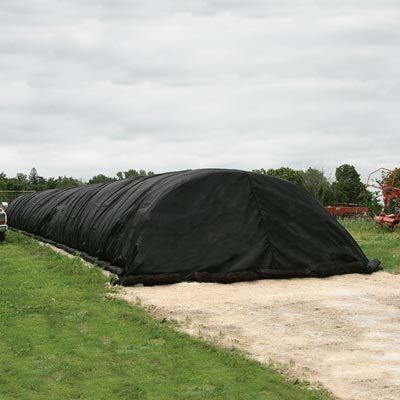 PolyMax® Mesh Silage Bag Covers offer protection from animal damage for silage piles covered with plastic tubes. Silage Bag Covers go over the plastic tubes to prevent any cuts or tears that would allow air to reach the silage. Gravel Bags are ideal for securing these covers as well. Silage Bag Covers protect the feed from rodents who try to break through the plastic, as well as from human traffic. Is there a more permanent solution for storing forage? 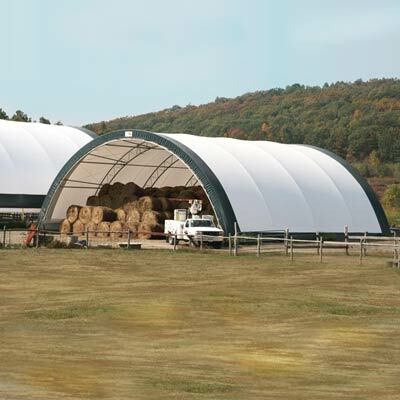 To keep forage completely out of the elements and in a more controlled environment, TekSupply offers an extensive line of ClearSpan™ Fabric Structures. These buildings come in a variety of sizes and styles, and can be permanent or temporary. During the winter, there will be no need to break up ice on top of bunkers or bales because the feed will be stored away in a completely covered structure. 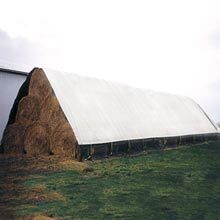 In the summer, feed will be protected from the sun by the durable building covers. 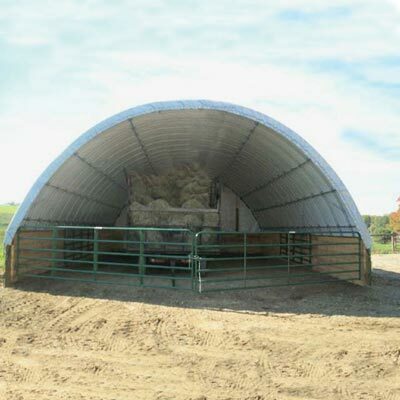 Fabric Structures offer an inside temperature 10° to 15° cooler in the summer and warmer in the winter to provide ideal temperatures for feed storage. 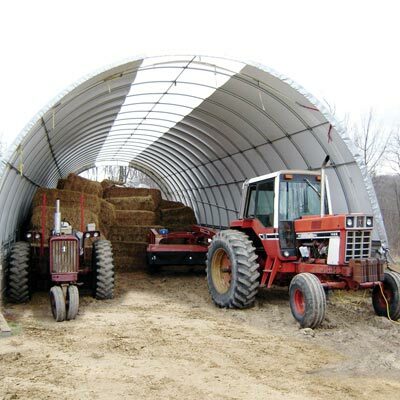 Since ClearSpan structures are more economical than wood or metal buildings, you will get more storage space for your money, leaving room to keep tractors and other equipment out of the elements. These structures are easy to assemble, customizable, and can be relocated if necessary. Since there will be virtually no spoilage, expect a return on investment in two to three seasons.